The tune is the title track to the forthcoming feature film of the same name directed by Terry George and starring Christian Bale, Oscar Isaac and Charlotte Le Bon in a love triangle drama set against the 1914 Armenian genocide. “The film and plot are your band mates and the song has to be true to the story and the characters in it,” explains the Soundgarden singer. “‘The Promise’ to me is mainly about paying homage to those we lost in the Armenian Genocide, but it’s also about shining a light on more recent atrocities. The same methods used in the Armenian genocide were used to carry out crimes against humanity in Bosnia, Darfur, Rwanda and right now in Syria on multiple fronts, contributing to a massive global refugee crisis. “Unfortunately, the words ‘never again’ seem like just words when we recall these mass executions of the twentieth century, as well as renewed racism and prejudice around the world,” adds Cornell. ”Even in the US, the warning signs – isolating groups based on race and religion – are evident. We really need to tell these stories and keep telling them in as many different ways as we can. Cornell will donate his proceeds from the song to the International Rescue Committee, whose role is to respond to the world’s worst humanitarian crises by helping to restore health, safety, education, economic wellbeing, and power to people devastated by conflict and disaster. "The Promise" premiered last fall at the Toronto International Film Festival and will open in theaters April 21. 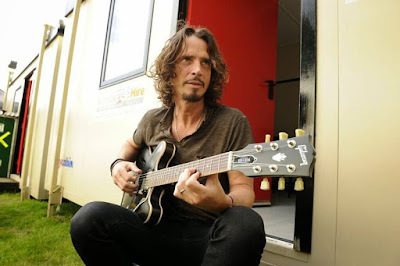 Cornell and Soundgarden recently announced the first series of dates for a spring tour of North America. Following three festival appearances in Florida in late April, the Seattle band will begin their headlining run at the Fox Theatre in Atlanta, GA on May 3; they’ll be joined by The Pretty Reckless and The Dillinger Escape Plan on select dates.